Despite showing very different economic performances, all of the countries surveyed in the Americas (Brazil, Canada, Mexico and the United States of America (US) are experiencing upward pressure on insolvencies. A major factor causing rising insolvencies in Canada (+4%), and to a lesser extent in the US (+3%), is low commodity prices. Another issue weighing on the business environment in the US is the lower external demand for exports. Low oil prices and low growth of productivity in Mexico, and the recession in Brazil, are factors forecast to lead to rising bankruptcies in these countries this year. As survey findings reveal, the challenging insolvency environment affects the way suppliers interviewed in the Americas protect their businesses against the risk of payment default by their business-to-business (B2B) customers purchasing on credit. Respondents in the Americas appear to be notably more inclined to sell on cash than to offer credit terms to their B2B customers. 43% of the overall B2B sales value in the Americas was reported to be transacted on credit terms (down from 45% last year). Although selling on cash protects businesses from payment default risks (as cash sales do not result in bad debts), it may lead to losing sales and market share to competitors who are offering credit terms. At country level, the proportions of cash and credit based B2B sales do not vary widely around the survey averages. In the US, 43% of the total B2B sales value was reported to be transacted on credit (no change over the past year). In Canada and Brazil, the percentage of credit based sales amounts to 44% (42% one year ago) and 45% (43% last year) of the total B2B sales value respectively. With 40% of the total B2B sales value transacted on credit (44% one year ago), suppliers interviewed in Mexico continue to be the least likely to offer credit terms to their B2B customers. 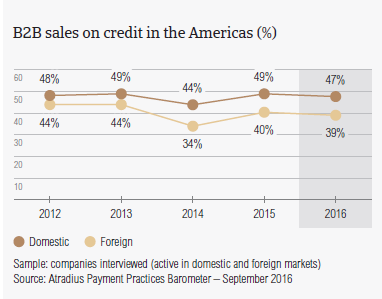 Along with a greater preference for cash-based B2B sales, respondents in the Americas seem to be more likely to offer credit terms domestically than abroad. This may reflect the perception that exporting brings different challenges than doing business in the home market, particularly when it is about getting an export customer to settle bills. Based on survey responses, this was the case in the Americas with, an average of 47% of the domestic B2B sales value (49.3% last year) and 39% of the export sales value being on credit (40.1% last year). Europe: 44.3% domestic and 37.4% foreign. By country, respondents in Brazil show the greatest spread between the percentage of domestic sales made on credit (50.9%, no change from last year) and the percentage of foreign sales made on credit (39.5%, up from 36.5% one year ago). This may be due to the country’s tight bank lending conditions, which enhance the role of trade credit as an alternative source of funding for a business. A notably stronger likelihood of selling on credit to domestic (44.4% of credit based sales, compared to 50.3% last year) than to foreign B2B customers (35.7%, versus 38% one year ago) is observed in Mexico as well. A more uniform approach to granting trade credit in either domestic or export B2B trade is seen in Canada (47.7% domestic and 40% foreign) and the US (44.8% domestic and 41.2% foreign). The greater openness to the use of trade credit with overseas markets, shown by US respondents, may be explained as a way to stimulate export sales. As mentioned earlier, all the countries surveyed in the Americas are experiencing upward pressure on insolvencies. Based on survey responses in the region, on average, 47.1% of the total value of domestic B2B sales on credit was paid late (up from 46.1% last year). This is notably above the 41.6% recorded in Europe. Foreign late payment amounts to 49.6% of the total value of export sales on credit (no change from last year). 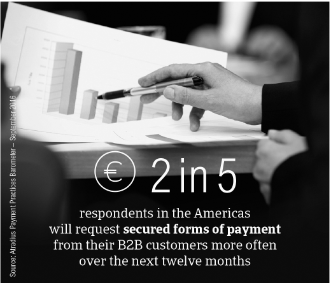 This compares to 38.9% recorded in Europe indicating that businesses in the Americas are notably more exposed to payment risk arising from B2B trade than businesses in Europe are. By country, the frequency of late payment and the total value of past due invoices varies widely. Despite being notably more inclined to sell on credit domestically than abroad, suppliers interviewed in Mexico seem to be the hardest hit by late payment of invoices in their home market. This was reported by 94.1% of respondents (96.5% last year), and resulted in an average of 54.6% of the total value of domestic B2B invoices unpaid after the due date (no change from last year). These findings are consistent with the DSO figure in Mexico, averaging 44 days (up from 35 days last year) which is the longest in the Americas. 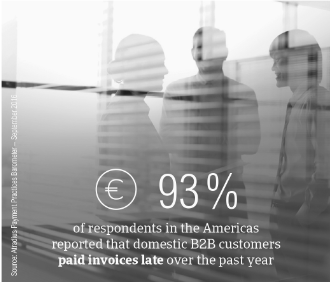 In Brazil and the US an average of 46% of respondents’ domestic B2B invoices were past due (92% of respondents in each country reported having experienced late payments). Over the past year, the average total value of domestic past due invoices in the US remained stable. In Brazil, however, it increased by nearly 3%, which points to a deterioration of domestic payment practices in the country. This is also the case for Canada, where the proportion of domestic past due invoices increased to 40% from 36.9% one year ago. According to survey findings in the Americas, US respondents are the most exposed to payment risk arising from B2B credit sales to customers overseas. The total value of US credit based exports paid late was 57.6% (56.3% last year), with 92% of the interviewed suppliers (90% last year) having experienced late payments from their foreign B2B customers. Exposure to foreign late payment is on the rise in Mexico, with 53.1% of the total value of foreign invoices overdue, up from 49.2% one year ago. This may explain why Mexican respondents seem to be more likely to sell on credit domestically than abroad. Exposure to foreign late payments increased in Canada as well. Here, 48% of the total value of export sales on credit was paid late (up from 43.8% last year). In contrast to Mexico, Canada and the US, which have seen increases in late payment of foreign invoices, Brazil has experienced a drop in late payments from overseas customers. The total value of foreign overdue B2B invoices in Brazil decreased to 40.2% from 44.2% one year ago. As was observed in a number of European countries, respondents in the Americas also try to maximize value and minimize payment risk associated with B2B trade on credit by extending modest payment terms averaging about 27 days from the invoice date. Payment terms extended to B2B customers by suppliers in Canada average 26 days, and are stable from last year. More lenient payment terms were extended by respondents in Mexico and Brazil (averaging 31 days and 33 days respectively). The shortest payment terms were observed by respondents in the US (averaging 20 days). This points to the US suppliers’ strong focus on protecting their businesses from the adverse impact of customers’ late payment on cash flow and profits. 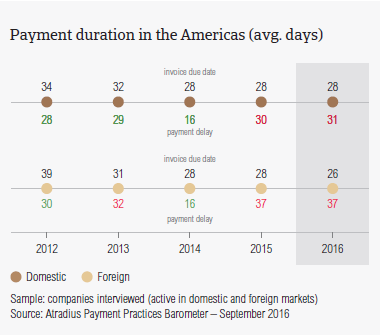 Despite being the least punctual in settling invoices of the countries surveyed in the Americas, domestic B2B customers of suppliers interviewed in Mexico are now granted slightly more lenient payment terms for invoice payment than last year (averaging 33 days, up from 29 days one year ago). The average payment terms granted to domestic B2B customers by suppliers interviewed in Brazil (32 days, same as one year ago), Canada (26 days, compared to 28 last year) and the US (21 days, versus 22 last year) did not change significantly. This is the case for payment terms extended to foreign B2B customers as well. The exception is Brazil, where payment terms granted to foreign B2B customers are now tighter averaging 29 days compared to 35 days one year ago. This shortening of the credit cycle through swifter payment terms observed in Brazil may point to an attempt to improve the liquidity position of businesses in a market with tight financial conditions. Domestic B2B customers of suppliers interviewed in the Americas seem to settle past due invoices quicker (on average 30 days late) than foreign customer do (37 days late). At country level, domestic overdue invoices are settled the swiftest in Canada (on average 23 days after the due date), followed by Brazil (28 days late), Mexico and the US (both 34 days late). Compared to last year, suppliers interviewed in Brazil now have to wait a little longer (an average of 4 days) for past due invoices to be paid by domestic B2B customers. In the other countries surveyed in the Americas, payment timing of past due invoices did not change significantly. As mentioned earlier, foreign B2B customers of suppliers interviewed in the Americas appear to be somewhat more relaxed when it comes to settling past due invoices. The most relaxed seem to be foreign customers of US suppliers, who pay overdue invoices, on average, 43 days late (45 days last year). This is the longest timing observed in the region surveyed. Mexico follows with 40 days, up from 36 days last year. Foreign past due invoices are paid the swiftest by B2B customers of suppliers interviewed in Canada and Brazil (32 days late each). Consistent with observations in Europe, respondents in the Americas experienced late payment of invoices most often due to the customers’ inability or unwillingness to meet payment obligations. This reflects the challenging insolvency environment in which businesses currently operate. 44.4% of respondents in the Americas (46.4% one year ago) reported that domestic customers delay payment of invoices most often due to liquidity constraints. Foreign late payment due to the same reason was reported by 31.1% of respondents (33.6% last year). Domestic late payment due to the formal insolvency of the customer was reported by 25.2% of respondents (24.2% last year). 23.3% of respondents (27.8% one year ago) reported this in respect to customers overseas. Fewer respondents than last year believe that customers delay payment of invoices intentionally to finance their businesses. This year 30% of respondents expressed this in regards to domestic buyers (down from 32.8% last year) and 27% of respondents (30.3% last year) in respect to customers abroad. Foreign buyers appear to very often delay payments due to reasons unrelated to their creditworthiness and beyond their control. These are the complexity of the payment procedure and inefficiencies of the banking system. Although foreign late payment due to these reasons was experienced by fewer respondents in the Americas (25%) than last year (30%), the fact that these reasons for payment delay were also frequently cited by businesses in Europe suggests that these are recurring payment risk factors in international trade. An appropriate management strategy is needed to ensure that the business has the adequate cash levels to fund its growth. Respondents in Brazil experienced the highest levels of domestic late payment due to liquidity issues of the customer (55.3%). The lowest levels of domestic late payment were experienced by US respondents (29.8%). Canada (40.7%) falls in between and Mexico (47.5% of respondents). These response rates reflect the upward pressure on insolvencies in these countries, that was mentioned at the beginning of this report. The perception that domestic customers do not pay invoices deliberately to finance their business is strongest in the US (nearly 32% of respondents, 36.6% last year) and Mexico (31.7% of respondents, 33.2% one year ago). Canada with 29.6% (35.8% last year) and Brazil 23.8% (26% last year) have the lowest response rates. Domestic late payment due to the formal insolvency of the customer was reported by nearly 27% of respondents in the US, Brazil and Mexico (no change from last year). This response rate falls to 17% in Canada. Oddly enough, survey findings reveal that in the US domestic late payment due to ineffective invoicing and to disputed invoices occurs almost as often as late payment due the formal insolvency of the customer. Foreign late payment due to liquidity constraints of the customer was reported most often in Canada and Mexico (33.3% of respondents each, versus 40% last year), and the US follows with 31.4%. Liquidity constraints of the customer was reported least often in Brazil (26.6% of respondents). As seen in respect to domestic late payment, 31.4% of US respondents, compared to 38.6% last year, have the perception that foreign customers purposely delay paying invoices to help finance their business. Brazil follows with 29.2% compared to 30.4% last year. This perception is shared by a lower average of respondents (22%) in Canada and Mexico. The response rate related to foreign late payment due to formal insolvency of the buyer is twice as high in Brazil and the US (30%, stable with last year) than in Canada and Mexico (15%). The standout finding here is that 38.1% of US respondents (compared to the 25.2% survey average) reported that foreign late payment is due to disputes over goods delivered or services provided that are inconsistent with what was agreed in the contract. Late payment of invoices, regardless of the reason, has a negative impact on cash flow and may threaten the viability of the business. 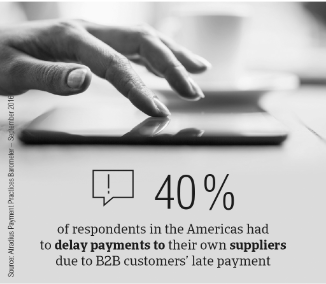 As a consequence of late payment, 39.3% of respondents in the Americas reported that they had to pay their own suppliers late, thus triggering a ripple effect throughout the supply chain. Nearly 30% of respondents claimed that they had to take specific measures to correct cash flow, and around 22% either lost revenues or had to pursue additional financing from banks, factors or others to get the necessary funds to pay their own creditors. Nearly 55% of respondents in Mexico delayed payments to their own suppliers because their customers paid them late. This was the case for an average of 33% of respondents in Canada, Brazil and the US. Specific measures to correct cash flow were most often taken by respondents in Brazil (38.6%), and by an average of 27% of respondents in each of the other countries surveyed in the region. The need to pursue additional financing from banks, factors or others was reported by around 22% of respondents in all four countries surveyed in the Americas. Loss of revenues was most often reported by businesses in Brazil and Mexico (around 27% of respondents each) and the least often in Canada (nearly 14% of respondents). The US response rate was nearly 22%). In light of the earlier mentioned findings, respondents in the Americas believe that a number of risk factors will threaten their business profitability in 2016. Although respondents’ opinions at overall survey level seem to be quite uniformly distributed [see Statistical Appendix, page XYZ], findings at country level highlight interesting differences. This largely reflects the diverse economic, business and financial conditions seen in the countries surveyed. In the US, Canada and Mexico, maintaining cash flow levels is considered the greatest challenge to business profitability by an average of 20% of respondents in each country. However, in the US and Canada, this opinion appears to reflect respondents’ concern about a likely fall in demand for products and services this year (15.3% and 17.1% of respondents respectively, versus a 13% survey average). In Mexico, respondents’ concern about cash flow levels appears to chiefly stem from inefficiencies in receivables management (17.5% of respondents, versus a survey average of 12.7%). Respondents in Brazil, in contrast, appear to be more concerned about containment of costs (18.2% of respondents compared to a survey average of 16%). This concern most likely arises from difficulties with the collection of outstanding invoices (13.6% of respondents compared to a 11.6% survey average), or from difficulties in accessing bank lending in the home market (13.2% of respondents, compared to a 7.7% survey average). This reflects the tight financial conditions of the Brazilian market. Another reason for concern expressed by respondents in the Americas is related to the DSO level (increased by an average of five days from last year). 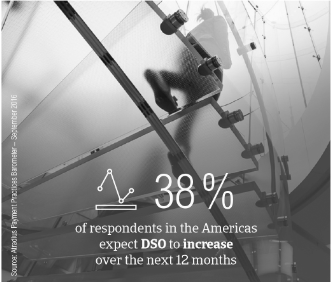 A quite staggering percentage of respondents (38%) expects DSO to increase over the next 12 months. To protect business profitability from the impact of late payment by customers, around 40% of respondents in the Americas reported they will not change their current mix of credit management tools (respondents in Europe: 44%). However, most of the respondents anticipate increasing the use of credit management tools that ensure a trouble free B2B sale on credit. 41.1% of the respondents (around 53% in Mexico and Brazil) will request secured forms of payment from their B2B customers more frequently. Around 40% (50% in Mexico and Brazil) will check the creditworthiness and track records of their customers more often over the next 12 months. Over the same time frame, 38% of the respondents anticipate an increase in their monitoring of customers’ credit risk as well. Nearly 37% of the respondents in the Americas (54.6% in Brazil) will sell more on a cash basis in B2B transactions this year. 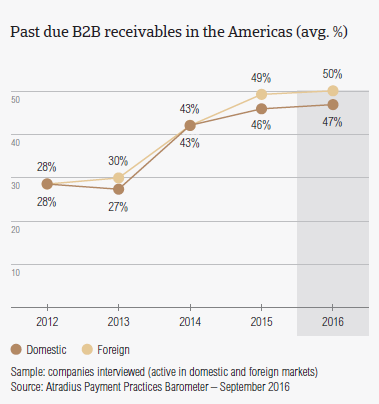 On average 1.4% (down 1.8% from last year, and compared to 1.2% in Europe) of the B2B receivables of respondents in the Americas was written off as uncollectable. 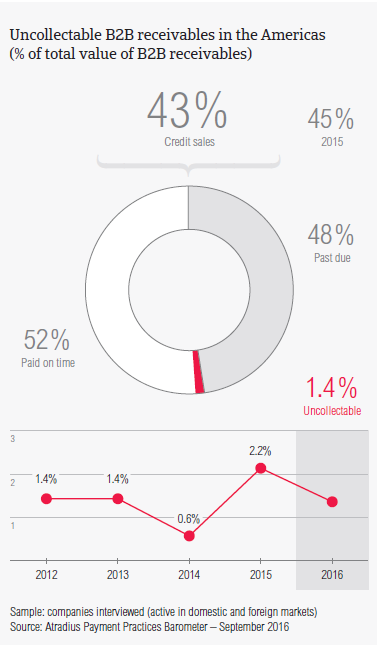 In Brazil, the proportion of uncollectable receivables was at 2%; consistent with last year. This reflects no improvement in collecting outstanding invoices in Brazil this year. The proportion was slightly lower in Mexico, at 1.6%, in the US 1.5%, and in Canada 1.1%. Uncollectable receivables in the Americas occur most often in the construction and consumer durables industries. Based on survey responses in the Americas, B2B receivables were reported to be uncollectable mainly due to the customer going bankrupt or out of business (53.5% of respondents, compared to 54.6% last year). Brazil has the highest percentage of respondents (55.2%) stating this reason. Write-offs due to the failure of collection attempts were reported by 36.8% of respondents in the Americas. This response rate is again highest in Brazil (43.6%). These findings once again reflect the still difficult insolvency environment in which Brazilian businesses operate. For an average 30% of respondents each, write-offs were either due to an inability to locate the customer or to the age of the receivables. These reasons for receivables write-off were most frequently mentioned by respondents in the US (35% for each of the reasons). Respondents in the Americas extended the most lenient payment terms (averaging 36 days from the invoice date) to B2B customers belonging to the machines and paper industries. B2B customers in the food sector were given the shortest payment terms, averaging around 15 days from the invoice date. On average, the poorest payment performance was observed with B2B customers in the construction industry, who took the longest to pay overdue invoices (an average of 38 days after the due date). The largest proportion of overdue payments was generated in the construction industry (around 50% of the invoice value ended up in late payments). Late payment of B2B invoices due to insufficient availability of funds from customers was reported to occur most often in the food, machines, metals, paper and services industries (around 55% of the respondents). Customers’ intentional use of outstanding invoices for financial advantage, which is the second most frequently cited reason for late payment of invoices, was most often reported in respect to customers from the electronics industry (around 42% of respondents). The majority of respondents in the Americas (40%) don’t expect changes in the payment behaviour of B2B customers over the next 12 months. More respondents (36%) expect an overall improvement in payment practices than a deterioration (28%). B2B customers expecting deterioration belong mostly to the consumer durables and food industries (around 34% of respondents each). 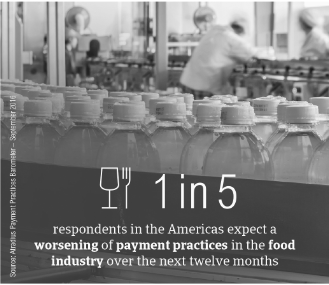 One in five respondents in the food industry expects the deterioration to be significant.